We have the greatest selection of great holiday gifts you will find anywhere! Shop on our holiday page or all over our web site for great selection and deals. 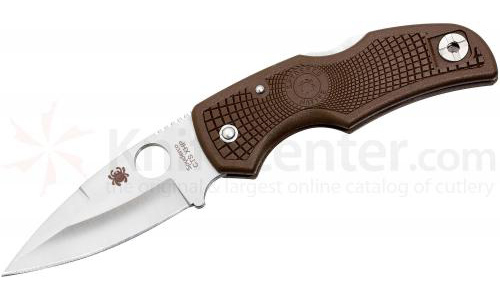 Spyderco’s ethnic series has amazed a lot of us through the last several years. 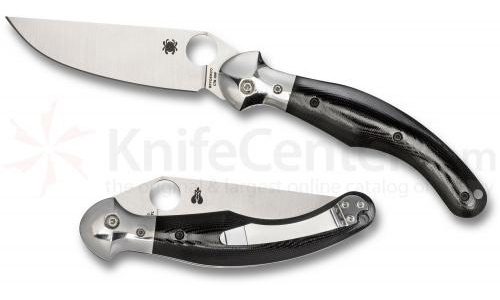 They have taken designs – some ancient – and modernized them in their own inimitable fashion, into modern Spyderco models. Included among them are the Jot Singh Khalsa, Bob Lum Chinese Models, the Ed Schempp Navaja, and the Nilakka Folding Puukko among others. This model, however, is really exceptional. The eastern European flavor is reflected in the stylized handle which fits an average sized hand very well. The dual extensions on the highly polished bolster serve as a thumb rest on top and a guard on the inside of the handle. 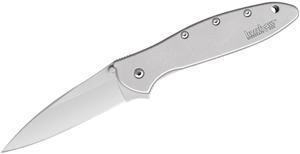 The materials seem really well thought out a with nicely polished and well formed G10 handle along with a top quality steel blade that is what Spyderco calls a full flat grind- meaning flat from the top of the blade to the top of the final bevel that goes to the cutting edge. Although all parts of the handle, bolster and pocket clip are highly polished, the blade is left with a satin finish. This is a great knife, made in Taiwan and presented at Spyderco’s high level of quality. Collector’s will want to have one of these so that, in years to come, they will be able to take this out and amaze others. The liner lock works very well and is buried just enough to avoid accidental release. These swing open easily, lock securely and close conveniently. We see this latest entry from Spyderco Knives as a real winner, even though the price is not low. You get what you pay for- at least in this case, and in our opinion. Whether you are slaying zombies, hunting a wild boar, or in need of the ultimate conversation piece, the United Cutlery M48 Apocalypse Spear is the answer. At ~ 44 inches long, the M48 is not overly cumbersome and the light-weight FRN (Fiberglass Reinforced Nylon) shaft also make this a very portable spear. 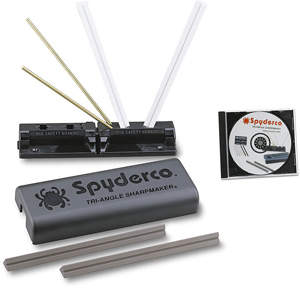 This spear features an extremely sharp Black Oxide-Coated 2Cr13 stainless steel blade and also comes with a Snap Sheath for safe and easy storing. 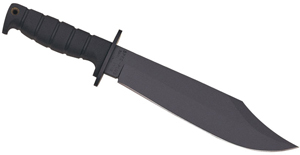 Get yours BEFORE the Apocalypse at www.knifecenter.com. 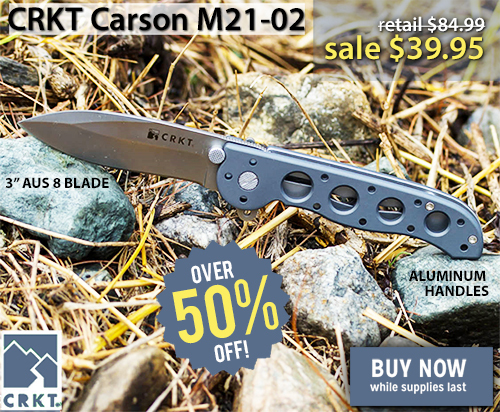 This week we’re happy to bring you a knife from Kit Carson’s aluminum-handled line at a greater than 50% discount. The lightness of the aluminum handle is one of the first things you’ll notice while handling this knife. The second thing you’ll probably notice is how smoothly and quickly it deploys with the patented “Carson flipper” – this despite having almost zero blade play. And then of course there’s the blade itself – made of premium AUS8 steel in a non-reflective finish, the blade has a deep belly terminating in a spear point; in fact the design of the spear point blade is very similar to that of Japanese spears, which were designed with one purpose in mind – to go right in when thrust into anything. You’ll have a hard time finding an EDC that matches the quality, craftsmanship, and features of this knife, especially at the price at which we’re offering it this weekend. Get yours before they’re all gone!